Kruckman Family Dentistry provides comprehensive dental care in one convenient location with no need for referrals! 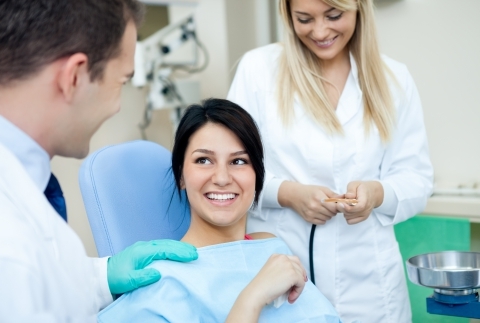 We specialize in providing each one of our patients with the gentle dental touch you deserve. For many, the dentist is not a place of joy and excitement. It is our goal to change that mindset and show you how true dental care should be done. By taking our time to fully explain what we are going to do, what you will feel, and what we will use, we believe that you can have a more realistic and comfortable expectation every time you come in. We aspire to build a long-lasting relationship with each one of our patients, getting to know them as our friends, and not just the teeth in their mouth. Taking care of your teeth does not have to be something you dread; with Kruckman Family Dentistry, it never is. Enjoy a heated aroma therapy neck wrap during your treatment while watching a flat screen television overhead with noise reduction headphones in your private treatment suite. Your satisfaction and comfort are what are most important to us. As a family practice, we know what it takes to make your child feel comfortable. Not only will they enjoy watching their favorite cartoon or movie on the television overhead, but they will look forward to visiting the toy box after each visit. We understand that this may be many children’s first time at the dentist, and we go above and beyond to ensure that after they leave, they want to come back time and time again. Dr. Kruckman! We are within reach for Victoria, Carver, and Waconia, and would be happy to take the time to get to know you and your family and answer any questions that you may have.